After the original Needles Lighthouse built on the cliff suffered problem due to mist and low cloud, Trinity House decided to build a new lighthouse on the outermost rock of the Needles. This involved cutting a platform into the rock and then building a 110 foot, circular, granite tower - this was completed in 1859. Originally the lighthouse was manned by 4 men, the Keeper and 3 Assistants, who would be on duty for 2 months and then have 1 month ashore. Changes of personnel and the supply of all the provisions had to be made by sea until a Helipad was built atop the lighthouse in 1987. 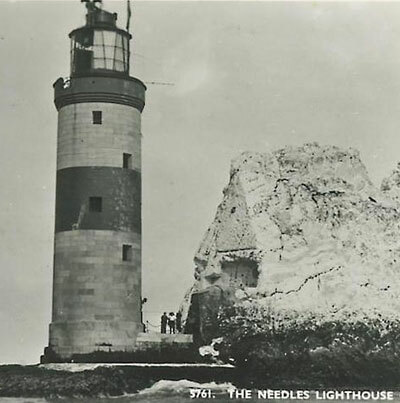 From the start, the Needles light was powered by electricity from its own 110 volt generator; this remained the situation until the lighthouse was automated in 1994 when a submarine power cable was installed from the Needles Battery on the cliffs above. Following the automation of the Needles Lighthouse, it is now unmanned and is controlled and monitored from the Trinity House Centre at Harwich, Essex.